At The Studio you’ll follow a broad curriculum in Year 10, developing important core knowledge and skills whilst specialising in subjects that will help you find your chosen digital or creative career. We listen to our students carefully and work with our Digital Entrepreneurship Network to put together the right combination of subjects for our coding, creativity and entrepreneurship pathways. You can start by asking yourself the question – am I a coder, a creative or an entrepreneur – or a combination of all three? 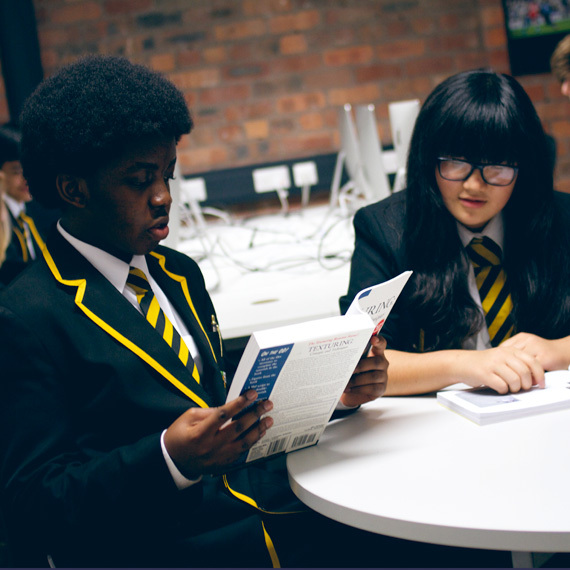 At Key Stage 4 you’ll study English language, English literature, maths, science, PE and digital leadership, through our Studio Futures programme. Choose from a core option of: computing, history, geography or Spanish, plus BTEC IT or BTEC creative media. Our Studio education is unique, because it includes project-based learning which allows you to develop your own products and skills through the Studio DEN – our Digital Entrepreneurship Network. As your skills develop, you’ll create a digital portfolio and collect evidence towards a set of KPIs (key performance indicators) that prove you’re experienced and employable in the digital sector. Your experience at the Studio is greater than the sum of its parts: you’ll do enrichment projects; develop as a digital leader; learn how to stay well and happy; and start planning for your future career by taking full advantage of all your opportunities. Our students are creators, not consumers. Technology is the enabler – it helps us create and achieve things, rather than being the end goal in itself. This empowers them to generate opportunities for themselves within this emerging, exciting sector.